I was really hoping we’d be back on the river this week but as soon as I arrived at the draw and saw Scotty’s van, I knew we’d be on the pond as he won’t fish the river! After breakfast we all drove out the pond to do the draw so Rob could see which pegs were available, there were no other anglers already there so he put in six pegs on each side, I really fancied a peg on the near side (as always) but pulled out peg 10 on the opposite bank and was a bit gutted as it hasn’t been great in recent matches. Things didn’t get any better when I took my kit to the peg and I had the wind straight in my chops and the icing on the cake was that I would have to look at Ash and Baz in their armchair pegs opposite, with the wind off their backs all day (I’m not bitter!). Rob on my left also had the wind in his face, as did Scott but to a lesser extent on peg 8, Fieldy and Steve P in pegs 6 and 4 were both fairly sheltered as was Terry on peg 2. I’m a big fan of dark groundbaits so today mixed up some Bait-Tech Pro Nat Dark and added a little Thatchers Dark to give it some more added darkness! 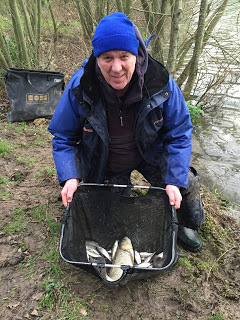 Rigs were the usual 0.5 gram Drennan Roach to fish on the deck and a little Preston Chianti for fishing shallow. 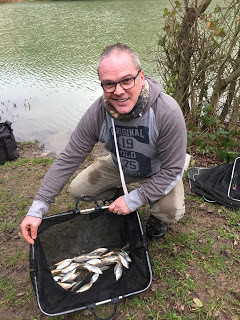 A single toot from Robs whistle signalled the start and I cupped in two balls of my lovely dark groundbait at 10 metres before starting with double red maggot on the hook. Scotty was into small roach straight away and Ash hooked a better fish, only to realise he hadn’t set his landing net up! He managed to grab the line and gently lift what looked like a decent roach out of the water. While this was going on my float remained motionless so I switched to a single maggot with the same result, Scott carried on catching small fish and it looked like Fieldy was getting a few as well but I wasn’t too worried at this early stage as I’d got off to a slow start last week. It was nearly half an hour before I had my first bite from a small chublet and I was already a long way behind Scott. I started to get the odd chublet along with some tiny roach and perch and was going nowhere fast, trying double maggot again did nothing to improve the stamp. I did have a small chublet that squirted out of my hand like a bar of soap and missed the keepnet and I chuckled to myself that I wouldn’t let that happen again. Next chuck I had another and very carefully unhooked it before leaning forward to put it in the net when, bugger me, it did the same thing, hit the rim of the net before bouncing to freedom! I was starting to sense this wasn’t going to be my day. After an hour I only had nine fish and could see Ash and Baz catching well and Scott and Fieldy were both getting plenty of small fish. The second hour was slightly better but every time I started to get a few bites, it wouldn’t last and the fish I was catching were tiny, I kept trying caster but they just weren’t having it and along with the wind I was starting to get a bit fed up with having to stop to wipe my glasses off and did I mention I was emptying my flask at an alarming rate! Rob was struggling too and to be honest I didn’t really know what to do to try and improve things. Hour three came and went and I was just going through the motions and spending longer on caster, hoping for some quality fish to put in an appearance but it just wasn’t happening. Rob landed a nice chub and I now needed snookers to avoid being last in the section! With about an hour and a half left I noticed Steve P was dredging for something with his landing net and it turns out he’d knocked his glasses off into the pond, he did eventually get them back but broke his landing net in the process and that was enough for him. Before he headed home, he did stop for a chat and handed over his nugget which was the highlight of the day so far! Typically as the light began to fade, I started to get some better roach on caster but it was way too little, way too late and I wasn’t too upset when Rob brought proceedings to a close. My final tally of 45 fish wouldn’t be winning any prizes today. 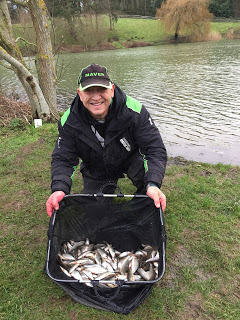 I packed up and went to assist Scott with the weigh in and get some photos, Terry in peg 2 had 4lb 9oz and then Fieldy had over 170 small fish for 9lb 1oz from peg 6. 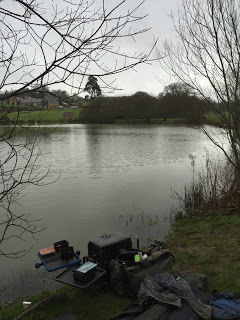 Scott was next and he had 206 fish for 10lb 8oz and had given me a right battering as my fish only went 3lb 14oz, Rob had a 5lb 15oz from peg 12 which included a good chub, so I got duffed up on both sides! 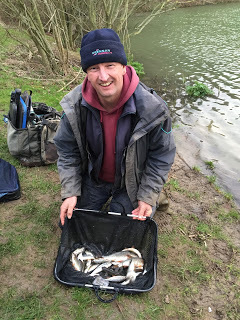 We drove round the other side to meet the others and Ash had won again, this time with 13lb 6oz, Baz had 8lb 14oz from peg 18, Bruce weighed 8lb 1oz from 22, Justin had 2lb 13oz from 24, Hurf weighed 2lb 10oz and had enjoyed himself as much as me and Karl had 1lb 14oz from peg 19. 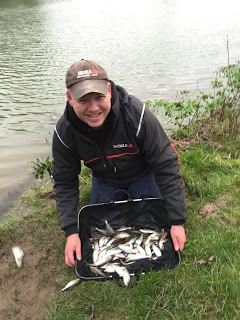 I really hadn’t enjoyed today very much, I just couldn’t get bites and the weather didn’t help, I would have caught a few more if I’d have fished single maggot all day but I just hate catching bits. That’s what makes fishing so intriguing, you think you’re getting to grips with a venue and then it bites you on the arse! In the league, after seven matches and dropping the worst result, Fieldy still leads with nine points, followed by Rob on twelve and Justin on fourteen. Also I’d just like to say a massive thanks to everyone who took the time to vote for me in the UK Blog Awards. I didn’t make the shortlist and was a bit gutted to be honest but there was some stiff competition, not many fishing blogs to be honest and I think it was an opportunity missed to get angling blogs some mainstream,recognition although Pondip (who I write for) have been shortlisted and are flying the flag for angling in the company category so good luck to them. Unlucky Jamie. Shame not to get on the river when it's fishable. Not long until the end of the season and there is all year to fish the pond. Cheers mate, yes hopefully we will get back on the river soon.